I shared this Sweet Bread recipe in the post for Taro Buns. Check out the video to see how the dough is made. The steps for making a variety of buns, rolls and breads are the essentially the same. After letting the dough rise for the first time, roll-out the dough as desired, making the various buns, rolls or breads. Cover with a damp towel and let rest until the dough doubles in size, approximately 30 minutes. Bake at 350 F (177 C) for 10-20 minutes, depending on the size. Bake for another 5 minutes or until golden. For a rich flavor, use butter instead of water in the egg wash. It makes everything so buttery good! Leave plenty of room between the buns or rolls for the dough to rise. It’s best if the buns and rolls are not touching initially. 7-8 dinner rolls can be baked in a 9 inch round baking dish. A dozen dinner rolls can be baked in a 13 inch x 9 inch baking pan. An easy way to dampen a kitchen towel is to mist it with water using a spray bottle. This lets you control the water so you don’t add too much. You don’t want the towel to be wet. 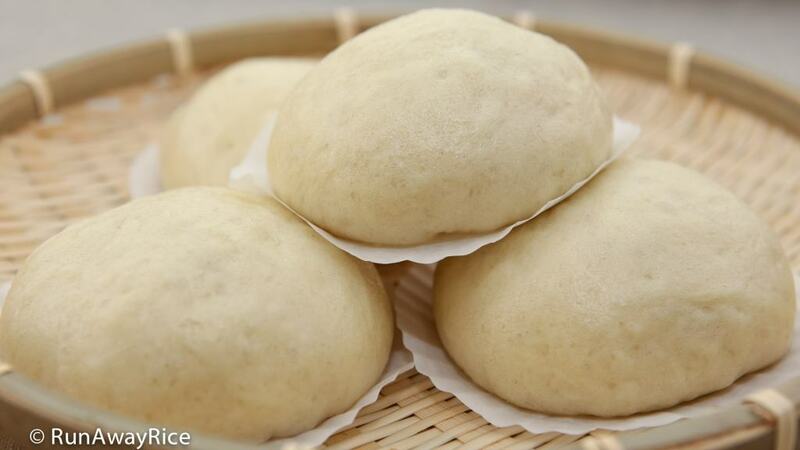 Store the buns or rolls at room temperature for 1-2 days. 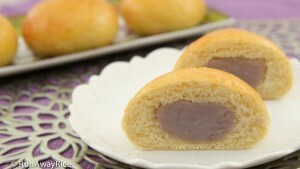 After this time, refrigerate and they are good for up to 1 week. To reheat, warm in the toaster oven or microwave on Low power for 20-30 seconds. 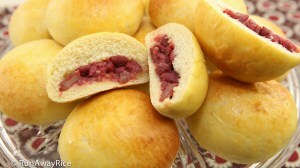 The sweet bread can be frozen for up to 3 months. Add vegetable oil into a large bowl. Brush the oil coating the inside of the bowl completely. In a small bowl, add the hot water, active dry yeast and 1 tsp sugar. Combine together. Let rest for 10 minutes or until the yeast mixture is foamy. In a mixing bowl, add the all-purpose flour, 1/4 cup sugar and salt. Using the dough hook, mix on Low speed for 15 seconds. Add the yeast mixture and milk. Lightly beat the egg and add. Add the butter. Mix on Low speed. During the first minute, scrape around the bowl using a spatula and push the dry ingredients toward the center. (The dough should start to form after 2 minutes.) Continue mixing for a total of 8 minutes. Shape the dough into a rough ball and place into the oiled bowl. Coat the dough with more vegetable oil. Cover the bowl with plastic wrap. Place into the oven and let rest until the dough doubles in size, approximately 1 1/2 to 2 hours. Lightly flour the work surface. Transfer the dough and then sprinkle more flour on top. Knead the dough for 2-3 minutes. Cut the dough into 12 equal pieces. Pinch and gather the dough making a rough ball. Transfer to large baking pan, leaving room in between each dough ball. Cover with a damp towel and let rest for 30 minutes or until the dough doubles in size. Whisk together the egg yolk and water. Place the rolls into the oven and bake for 10 minutes. Remove from the oven and brush the egg wash on the rolls. Return to the oven and bake for another 5 minutes or until golden. Transfer to a wire cooling rack and allow to cool. Enjoy the rolls while hot and fresh. Store at room temperature for 1-2 days. Refrigerate for up to 1 week. Divide the dough into 3 equal portions, approximately 8 oz each. Using a rolling pin, flatten each portion into a circle. Cut the circle into 8 equal slices. Take one of the slices and starting at the shortest side of the triangle, roll the dough to the point. Repeat this same process with the remaining sections of dough. Cover with a damp towel and let rest until the dough doubles in size. Bake for 10 minutes at 350 F (177 C). 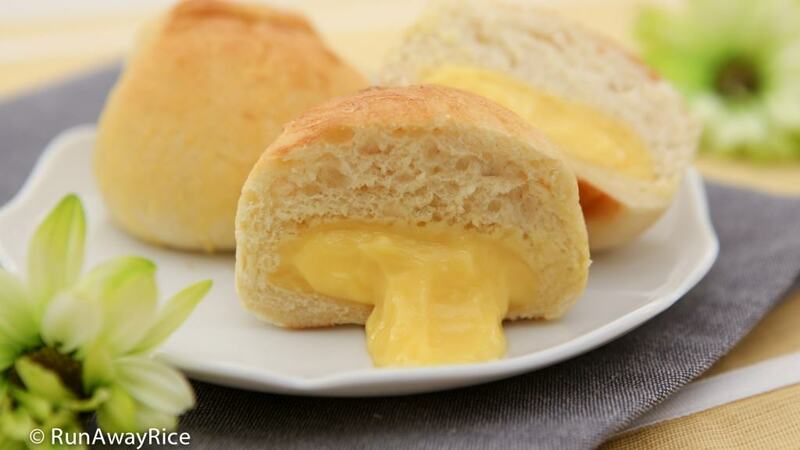 Brush the rolls with the egg wash. Return to the oven and bake for another 5 minutes or until golden. Divide the dough into 16 equal pieces, approximately 1.5 oz each. 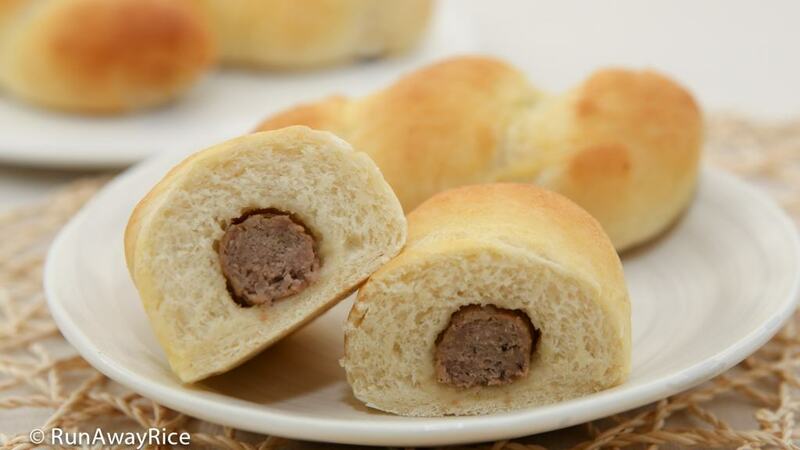 Take a piece of dough and roll it into a rope, approximately 3 times the length of the cooked breakfast sausage. Wrap the dough around the sausage link. Roll it gently on the work surface to even out the dough. Measure out 3 sections of dough, approximately 3 oz each. Flatten each section into a rectangle about 4 inch x 10 inch. 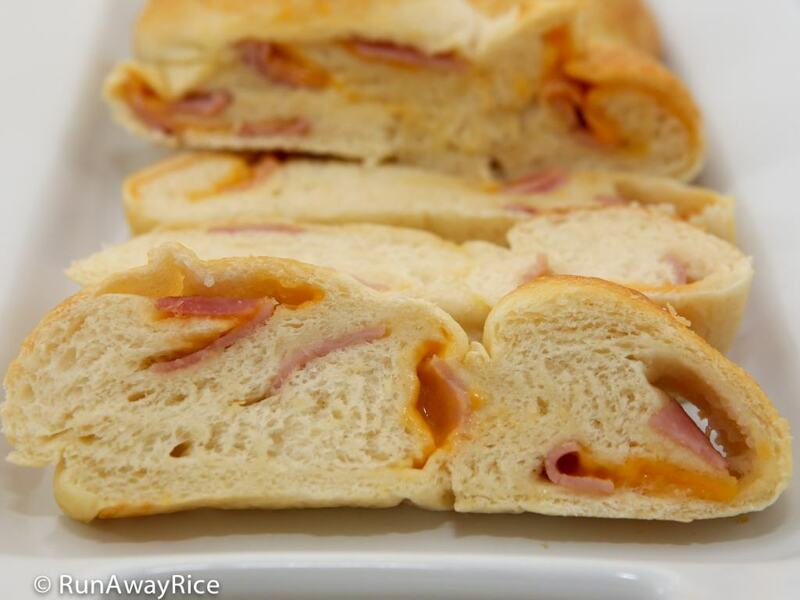 On top of each section of dough, place thin slices of cooked ham and cheese. Roll up each section of dough making 3 long ropes. Placing the seam sides down, braid the ropes together. Tuck the ends under and smooth out the braid. Bake for 20 minutes at 350 F (177 C). Brush the bread with the egg wash. Return to the oven and bake for another 5 minutes or until golden. In a small saucepan, bring the milk to a gentle boil over Medium heat and then turn-off the heat. Measure out 1/2 cup hot milk and set aside. Leave the remaining milk in the saucepan. In a medium bowl, add the sugar, flour, corn starch, egg yolks and the milk set aside earlier. Whisk together combining all ingredients well. Using a sieve, strain the custard mixture into the milk still in the saucepan. Over Medium Low heat, stir constantly while cooking the sauce until it thickens, approximately 3-4 minutes. Turn-off the heat. Whip the custard vigorously for 1 minute to remove any lumps. Add the vanilla extract and combine well. Transfer to a bowl and cover the custard with plastic wrap to prevent a skin from forming. Shape the dough into a log about 12 inches long. Cut into 12 equal pieces and shape each piece into a rough ball. Cover the dough with plastic wrap to keep it from drying. Take a dough ball and flatten it slightly with your fingers. Use a rolling pin, flatten into a 3 inch circle. Use a cookie scoop and transfer 1 1/2 Tbsp filling and place in the center of the dough. Gather up the dough enclosing the filling ball. At the top of the ball, pinch the dough together and then twist. Place the twisted-end facing down on the work surface. To smooth and shape the bun, cup your hand around the ball and rotate in a circular motion for about 10 seconds. Pat and rotate the ball between your palms to round out the bun. Transfer the buns to a large baking tray. Continue with the same steps until all buns are made. Cover with a damp towel and let rest for 30 minutes. Place the buns into the oven and bake for 10 minutes. Remove from the oven and brush the egg wash on the buns. Return to the oven and bake for another 5 minutes or until golden. Transfer to a wire cooling rack and allow to cool. Take a dough ball and flatten it slightly with your fingers. Use a rolling pin, flatten into a 3 inch circle. Use a cookie scoop and transfer 1 1/2 Tbsp filling and place in the center of the dough. Gather up the dough enclosing the filling ball. At the top of the ball, pinch the dough together and then twist. Place the twisted-end facing down on the work surface. To smooth and shape the bun, cup your hand around the ball and rotate in a circular motion for about 10 seconds. Pat and rotate the ball between your palms to round out the bun. Transfer the buns to a large steamer tray. Continue with the same steps until all buns are made. Cover with a damp towel and let rest for 30 minutes. 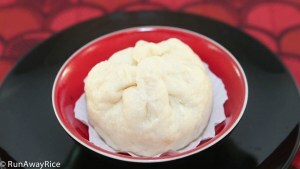 Steam the buns over High heat for 10-12 minutes. For uncooked meat fillings, steam for 20 minutes. This Sweet Bread recipe is easy to make, delicious and super versatile. The basic dough makes scrumptious sweet roll / dinner rolls. 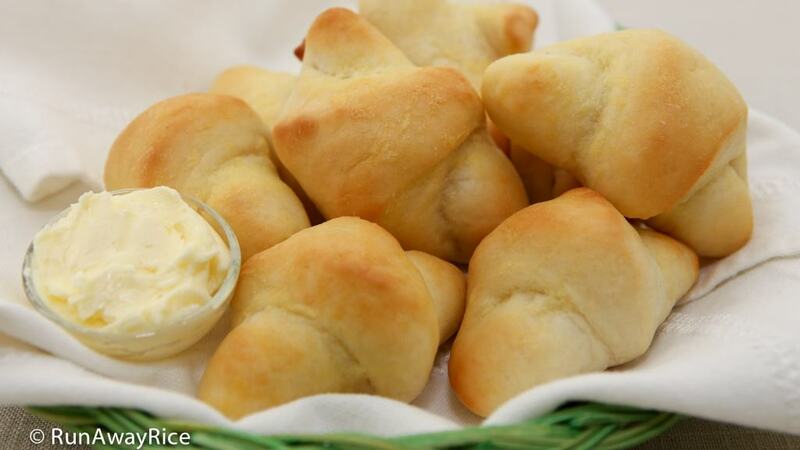 Use this same recipe to make an assortment of sweet and savory buns, crescent rolls, stuffed rolls and breads and more. The possibilities are endless! Enjoy the the rolls while hot and fresh. Leave plenty of room between the buns and rolls for the dough to rise. It's best if the buns or rolls are not touching initially. 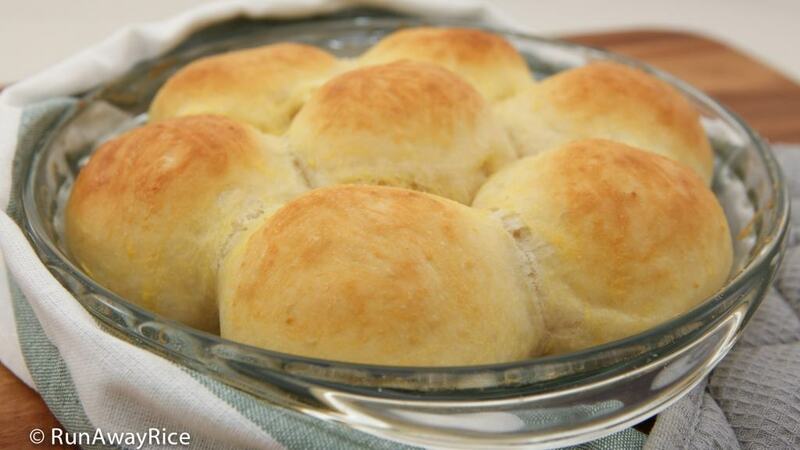 7-8 dinner rolls can be baked in a 9 inch round baking dish. A dozen dinner rolls can be baked in a 13 inch x 9 inch baking pan. An easy way to dampen a kitchen towel is to mist it with water using a spray bottle. This lets you control the water so you don't add too much. You don't want the towel to be wet. Store the rolls at room temperature for 1-2 days. After this time, refrigerate and they are good for up to 1 week. To reheat, warm in the toaster oven or microwave on Low power for 20-30 seconds. The rolls can be frozen for up to 3 months. I want to thank you for this recipe. I used it to make loafs of bread family loved it. Do you have a link to more recipes. I am glad to hear your family enjoyed this recipe. You can use my Recipe Index or Recipe Gallery to find more recipes. I’ll be sharing another bread recipe later this week. 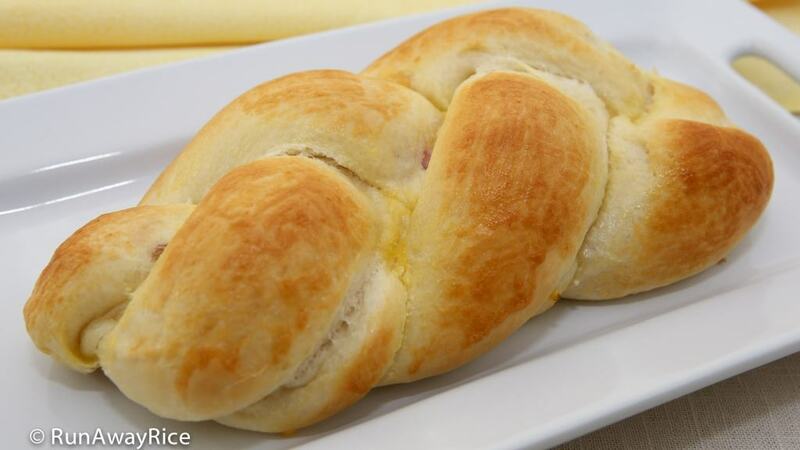 I made 3 braided ham and cheese loaves using your Sweet Bread recipe. I used cooked ham and cheddar cheese as you did, didn’t add too much to keep it light. My young boys absolutely loved it! They’re perfect for snacking and in lunch boxes. Thanks so much for sharing the recipe! Hi Chi, hope you are well. Thank you for the recipe. Question on dry yeast, is there any particular brand that you would recommend ?